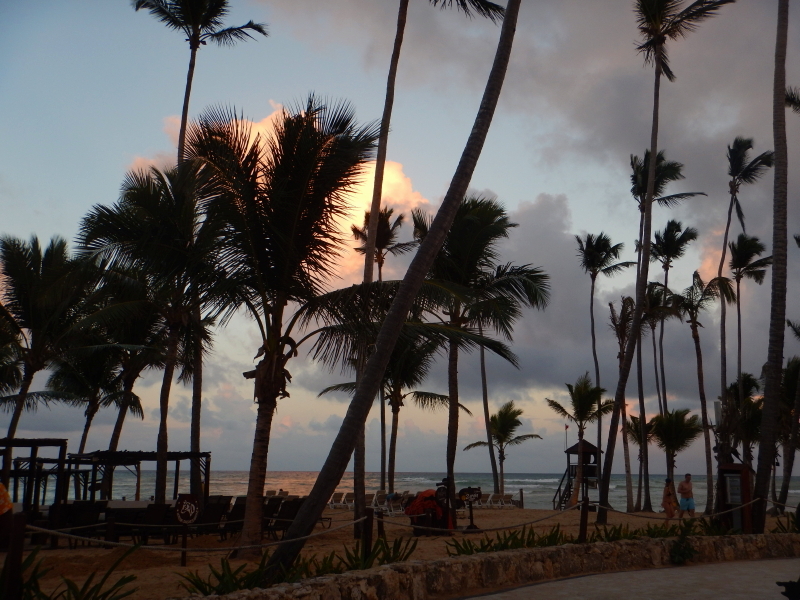 One of the things I was intrigued by during our week in Punta Cana was the occurrence of daily passing showers. It often happened without warning. Sometimes the drops appeared to be falling out of blue sky. Clouds frequently floated past, though very few actually dumped rain. The ones that did, provided enough regular moisture, they have no need for a mechanical irrigation system. The air never felt oppressively humid, but the difference from the dry winter air at home was definitely noticeable. I suppose the breeze off the ocean helps moderate the atmosphere. 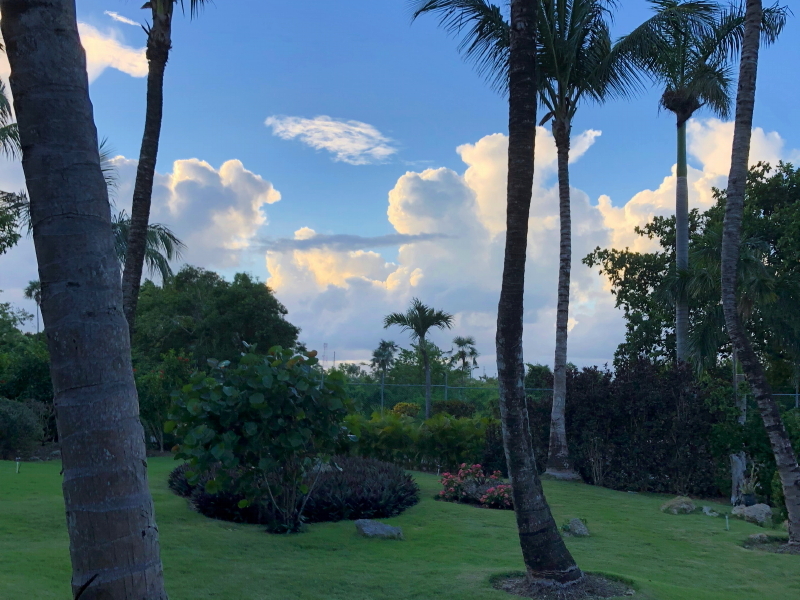 Several times, we walked to breakfast in beautiful morning sunshine, and while we were eating, the view outside would suddenly reveal a soaking shower. By the time we finished eating and stepped back outside, the sun was shining again and the walkways were already beginning to dry. A couple of times we were poolside for the surprise showers. The shade umbrellas of palm tree leaves provided enough cover to keep our towels and stuff from getting soaked. Towels on the recliners in the pool didn’t fare so well. 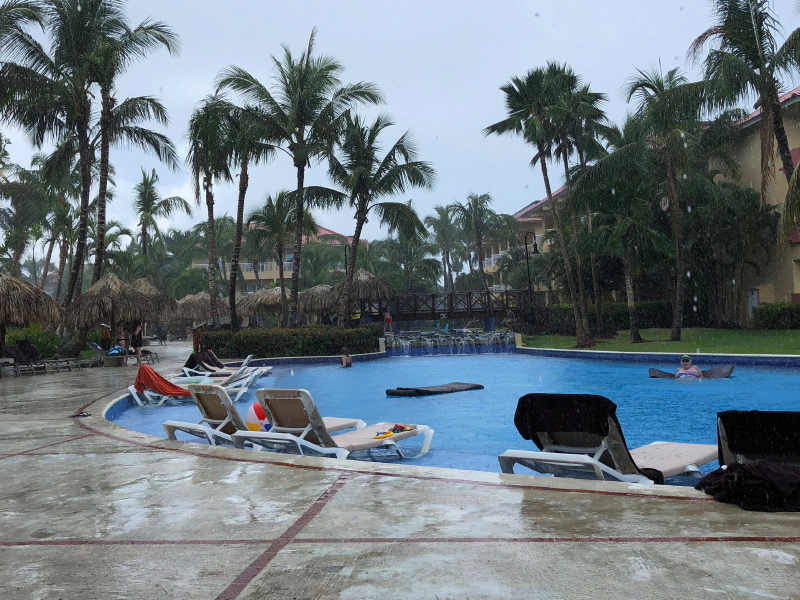 The frequent, brief soakings seemed like the perfect conditions for growing the lush landscape they maintained daily at the resort. I took note of the machete they used to trim their hedges, even though we don’t have any hedges to be trimmed at Wintervale. The tool produced a very clean line, in the hands of an experienced artisan. When they closely cropped the grass areas, I felt right at home with the sound of the power trimmer that was identical to what we use along our fence lines and around the labyrinth. I had to restrain myself from asking if I could help the landscaping crew for a day. Actually, I considered asking if any of them would consider coming to Wisconsin to work on our property, but the timing didn’t seem right. With our temperatures down in the double-digits below-zero range, there just isn’t a lot of yard work happening around here for a while.